An Inward Gaze showcases the work of Arielle Bobb-Willis and Brittney Cathey-Adams, two women who make sculptural, performative images that counter the male gaze and its prevalence in art history. In doing so, they illustrate how this power dynamic bolsters pervasive gender, race, and body size stereotypes in contemporary art and pop culture. Blue Sky’s Exhibition Committee was intrigued by the pairing of Bobb-Willis’ and Cathey-Adams’ work and thought that the exhibition will both engage viewers aesthetically and foster important conversations about photography in relation to gender, race, and self-representation. Bobb-Willis’ vivid staged photographs use the human form as source material and as stand-ins for self-portraits representing her own complex emotional struggles. 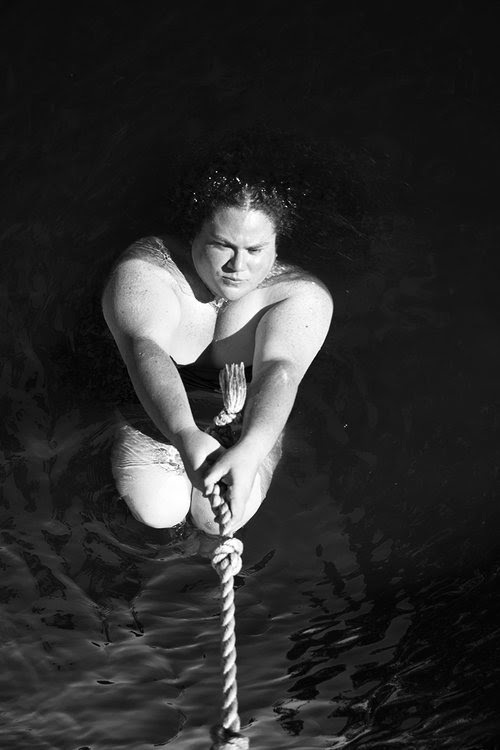 Cathey-Adams creates black and white self-portraits in various natural settings that declare personal agency in representation, and defy historical stigmas attached to women who do not fit an idealized physical mold. The exhibition will be on view May 2 – June 2, 2019 at Blue Sky. The curators and artists will travel to Portland to speak about the exhibition (details TBD). Now in its second year, Blue Sky’s Curatorial Prize provides an opportunity for curators to present an exhibition of photo-based work, along with related programming and publications. Our inaugural winner was curator Ashley Stull Meyer’s exhibition Ultra Vivid Dreaming. Roula Seikaly is a writer and independent curator based in Berkeley, and Humble Arts Foundation’s Senior Editor. Her writing is featured on platforms including Aperture, Photograph, Saint Lucy, Strange Fire Collective, Camerawork, Hyperallergic, and KQED Arts. She has curated exhibitions at the Utah Museum of Fine Arts, the Wattis Institute for Contemporary Arts, SOMArts, and SF Camerawork. Jon Feinstein is a Seattle and New York City-based photographer, curator, writer, and co-founder of Humble Arts Foundation. Jon has curated numerous exhibitions over the last decade in venues including Glassbox Gallery in Seattle, The Filter Photo Festival in Chicago, Photographic Center Northwest in Seattle, Hasted Kraeutler in NYC, Affirmation Arts in NYC, Barclays Arena in Brooklyn, NYC and Milk Studios in NYC. His curatorial projects have been featured in Aperture, The New York Times, The New Republic, BBC, VICE, The New Yorker, Hyperallergic, Feature Shoot, and American Photo, and his writing has appeared in VICE, TIME, Slate, GOOD, Daylight, Photograph, and PDN.